Hair loss treatments can vary depending on the hair loss type, but what most hair loss types have in common is that they usually stem from a disruption of the normal Hair Growth Cycle. For hair loss brought on by, for example, stress or diet, it is a good idea to address the cause, while simultaneously treating the hair loss condition by normalising the Hair Growth Cycle. Basically, the Hair Growth Cycle has 3 phases, the Anagen (growth) phase, the Catagen (transition) phase and the Telogen (resting) phase. Normally, during the growth phase around 85-90% of the hair is actively growing, while 1% is in the transition phase and approximately 10-15% of the hair is in the resting phase from where the hairs are eventually shed before the cycle is repeated. During a hair growth disruption, which can show as hair loss, thinning or excessive shedding, the Hair Growth Cycle is almost always affected. A Disrupted Hair Growth Cycle means that the growth phase is shortened, which causes the hairs to stop growing prematurely. Consequently, the entire Hair Growth Cycle becomes affected and the hairs enter the transition phase earlier than normal. Likewise, the resting phase becomes prolonged, which results in the excessive shedding and fewer hairs re-entering the growth phase, resulting in weak or lacking regrowth. A hair growth disruption can be caused by a number of different factors, some of which are hard, if not impossible, to control. Among the more common causes are acute and chronic stress, hormonal changes, for example, during pregnancy or menopause, general health issues, including diabetes and a number of autoimmune disorders, diet, smoking, some medications and genetic factors. Treatments for hair loss or hair loss solutions should as a first step focus on restoring the normal the Hair Growth Cycle and address the disruption causing the hair loss or thinning. Nourkrin® with Marilex® is based on 30 years of knowledge and research in hair loss and proteoglycans that work together with the normal Hair Growth Cycle for normal, healthy hair growth and to help support the overall life and function of hair follicles. Nourkrin® with Marilex® is a scientifically formulated, natural, safe and drug-free product that is globally used as a primary therapy to address hair growth disorders. 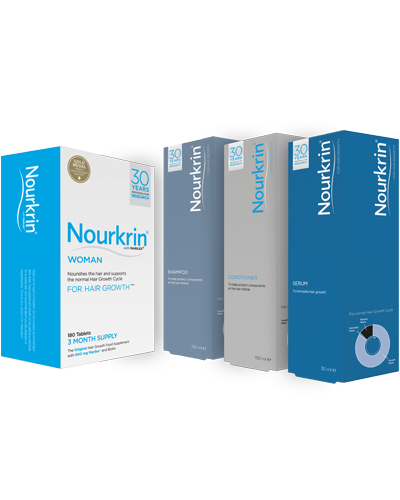 Due to the natural duration of the Hair Growth Cycle, it is recommended that Nourkrin® should be taken for a minimum of 6 months for the best result. An effective hair loss treatment can be of vital importance for the sufferer as hair loss can have a severe psychological impact. Furthermore, the increased stress of experiencing hair loss can worsen the condition. It is important to start a primary therapy to address the initial hair loss and to seek medical advice to attempt to pinpoint the cause of the hair loss and to account for any possible underlying health conditions that might cause hair loss. Why is Nourkrin® a 6 month programme? This is simply due to the prolonged nature of the Hair Growth Cycle itself. At any point in time, some hairs are in the Anagen (growth) phase, while others are in the Telogen (resting) phase. What happens if I stop taking Nourkrin® after 6 months? If your hair loss is due to acute, temporary factors, such as stress or hormone changes, your results after 6 months may remain over time – given that these lifestyle factors have improved or changed. If your hair loss is related to genetics or chronic in nature, the condition may return after the treatment has ended.